As you can see from other posts on this blog, I'm working on transliteration. Comments are welcome on the examples (of "Academic" and "Ashkenazic"). What is your transliteration scheme? Where did you learn it? I have been working a bit more on the transliteration, and added a piece of the kametz katan component. For this, see the transliteration of korbanchem. I've also added a bit of handling for the Shem haShem. See the Shem alone, and when with a leading lamed. Note also how I handle patach ganuv. Here is a transliteration of the beginning of parshat Vayikra (1:1-9), in Academic and in Ashekenazic. ב דַּבֵּר אֶל-בְּנֵי יִשְׂרָאֵל, וְאָמַרְתָּ אֲלֵהֶם, אָדָם כִּי-יַקְרִיב מִכֶּם קָרְבָּן, לַה'--מִן-הַבְּהֵמָה, מִן-הַבָּקָר וּמִן-הַצֹּאן, תַּקְרִיבוּ, אֶת-קָרְבַּנְכֶם. 2 Speak unto the children of Israel, and say unto them: When any man of you bringeth an offering unto the LORD, ye shall bring your offering of the cattle, even of the herd or of the flock. ג אִם-עֹלָה קָרְבָּנוֹ מִן-הַבָּקָר, זָכָר תָּמִים יַקְרִיבֶנּוּ; אֶל-פֶּתַח אֹהֶל מוֹעֵד, יַקְרִיב אֹתוֹ, לִרְצֹנוֹ, לִפְנֵי ה. 3 If his offering be a burnt-offering of the herd, he shall offer it a male without blemish; he shall bring it to the door of the tent of meeting, that he may be accepted before the LORD. ד וְסָמַךְ יָדוֹ, עַל רֹאשׁ הָעֹלָה; וְנִרְצָה לוֹ, לְכַפֵּר עָלָיו. 4 And he shall lay his hand upon the head of the burnt-offering; and it shall be accepted for him to make atonement for him. ה וְשָׁחַט אֶת-בֶּן הַבָּקָר, לִפְנֵי יְהוָה; וְהִקְרִיבוּ בְּנֵי אַהֲרֹן הַכֹּהֲנִים, אֶת-הַדָּם, וְזָרְקוּ אֶת-הַדָּם עַל-הַמִּזְבֵּחַ סָבִיב, אֲשֶׁר-פֶּתַח אֹהֶל מוֹעֵד. 5 And he shall kill the bullock before the LORD; and Aaron's sons, the priests, shall present the blood, and dash the blood round about against the altar that is at the door of the tent of meeting. ו וְהִפְשִׁיט, אֶת-הָעֹלָה; וְנִתַּח אֹתָהּ, לִנְתָחֶיהָ. 6 And he shall flay the burnt-offering, and cut it into its pieces. ז וְנָתְנוּ בְּנֵי אַהֲרֹן הַכֹּהֵן, אֵשׁ--עַל-הַמִּזְבֵּחַ; וְעָרְכוּ עֵצִים, עַל-הָאֵשׁ. 7 And the sons of Aaron the priest shall put fire upon the altar, and lay wood in order upon the fire. dabbēr ʾel-bənê yiśrāʾēl, wəʾāmartā ʾălēhem, ʾāḏām kî-yaqrîḇ mikkem qorbān, laʾdōnāy--min-habbəhēmāh, min-habbāqār ûmin-haṣṣōʾn, taqrîḇû, ʾeṯ-qorbanḵem . Midrash Rabba (48:5) has an interesting spin on the singling out of Betzalel. While it is homiletic, it fits into an existing theme in the peshat of the pesukim, and also relies on a very clever play on a linguistic ambiguity in the text, one which most casual and many serious readers of midrash will miss. יז כָּל-כְּלִי יוּצַר עָלַיִךְ, לֹא יִצְלָח, וְכָל-לָשׁוֹן תָּקוּם-אִתָּךְ לַמִּשְׁפָּט, תַּרְשִׁיעִי; זֹאת נַחֲלַת עַבְדֵי ה' וְצִדְקָתָם, מֵאִתִּי--נְאֻם-ה. Hashem has created the smith who brings forth the weapons, and creates the wasters. Hashem is in full control of the situation, and so they will not not succeed since Hashem does not will it. The Midrash takes pasuk 16 and reads it as referring to Betzalel: הִנֵּה אָנֹכִי, בָּרָאתִי חָרָשׁ - "Behold, I have created the smith..."
After all, the complex work of the Mishkan requires great craftsmanship. Perhaps this can all be attributed to Betzalel's greatness. However, Hashem created the smith, and gave him this wisdom and skill. The midrash interprets the continuation of the pasuk as referring to how the Mishkan atoned for the sin of the golden calf. נֹפֵחַ בְּאֵשׁ פֶּחָם because the sin golden calf involved fire (as Aharon said, "and I cast it into the fire and this calf came out.") Perhaps this same phrase refers to Betzalel's fixing of the sin (see commentaries). Presumably, וּמוֹצִיא כְלִי לְמַעֲשֵׂהוּ is understood as a reference to the Mishkan and its vessels. The midrash draws a parallel to the student of a doctor who places a plaster on a wound, and the wound heals. People praise the student of the doctor, but the doctor says to them, "Praise me who taught him." Similarly, people would praise Betzalel, saying that he created the Mishkan with his own wisdom and understanding -- chochma and tevuna, and Hashem says, "It is I who created him and taught him, as it states הִנֵּה אָנֹכִי, בָּרָאתִי חָרָשׁ. Therefore, Moshe said (in Vayekhel, in Shemot 35:30) רְאוּ קָרָא ה בְּשֵׁם. How is this pasuk in Vayakhel a prooftext? Perhaps it is not. Perhaps this is a way of concluding the homily, now that we have drawn the idea of Betzalel, mentioned in this pasuk. However, then לפיכך, "therefore," which introduced the pasuk, is a bit awkward. Perhaps what was meant was the continuation of the pasuk - sometimes a derasha is made from the continuation, and only the beginning is cited. Indeed, the next pasuk, as we shall see, continues the current pasuk and bears a message with a similar theme on the near-peshat level. However, is not necessarily what is happening here. Rather, it is possible that the midrash engages in a close reading of the pasuk, and makes use of a nice ambiguity in the phrase רְאוּ קָרָא ה בְּשֵׁם. If you recall, a while back I discussed an ambiguity in parshat Vayeitzei, in the naming of Yaakov's sons. Three phrases are used - וַתִּקְרָא שְׁמוֹ; עַל-כֵּן קָרְאָה שְׁמוֹ; and עַל-כֵּן קָרָא-שְׁמוֹ. The first two certainly seem to mean "she called his name." The last, as various scholars note, means either "he called his name" or "therefore was his name called," which is the passive. I should how even without emending the text, the text as vocalized can also mean "she called," and I give other examples of this phenomenon. Locally, there are two עַל-כֵּן קָרְאָה שְׁמוֹ and only one עַל-כֵּן קָרָא-שְׁמוֹ, and so Speiser emends the one (קרא) to match the two (קראה), but I argue there that if one is emending, one should emend to have the two match the one, since globally the phrase together with עַל-כֵּן always occurs with קרא, which is used with an anticipates the passive. See my post of Vayeitzei for more details. Anyhow, what comes out of this discussion is the fact that קָרָא can mean either "he called" or "was called." In this instance, in Vayakhel, the pasuk states רְאוּ קָרָא ה בְּשֵׁם, I put forth that the Midrash is noting the ambiguity and reading it, "Behold, Hashem is called/cited/credited." See the usage of Amar X Beshem Y. Thus, when Betzalel is credited, Hashem is credited as well. We thus have two common elements of midrashic construction - (1) a pasuk taken from a distance location and applied to local subject matter, and (2) a close reading of a local pasuk, taking advantage of a syntactic ambiguity. ל וַיֹּאמֶר מֹשֶׁה אֶל-בְּנֵי יִשְׂרָאֵל, רְאוּ קָרָא ה בְּשֵׁם, בְּצַלְאֵל בֶּן-אוּרִי בֶן-חוּר, לְמַטֵּה יְהוּדָה. 30 And Moses said unto the children of Israel: 'See, the LORD hath called by name Bezalel the son of Uri, the son of Hur, of the tribe of Judah. לא וַיְמַלֵּא אֹתוֹ, רוּחַ אֱלֹקִים, בְּחָכְמָה בִּתְבוּנָה וּבְדַעַת, וּבְכָל-מְלָאכָה. 31 And He hath filled him with the spirit of God, in wisdom, in understanding, and in knowledge, and in all manner of workmanship. Thus, pasuk 30 designates Betzalel as the craftsman, and pasuk 31 makes clear that it is Hashem who has filled him with the spirit of God, and has given him this chochma and tevuna, and thus Hashem should be credited. Brayta and Rav Acha bar Yaakov, Pesachim 7a. note the mikaan ata omer. parshat Tetzaveh: Identifying the Stones: יָשְׁפֵה - yāšəp̄ēh. The name means "spotted stone", and is derived from Anglo-French jaspre, from Old French jaspe, from Latin iaspidem, the accusative of iaspis, from Greek iaspis, via a Semitic language (cf. Hebrew yashepheh, Akkadian yashupu), ultimately from Persian yashp. 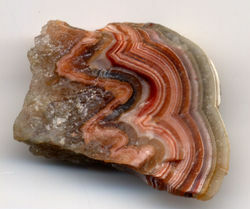 Jasper is an opaque, impure variety of quartz that is usually red, yellow or brown in color. This mineral breaks with a smooth surface, and is often used for ornamentation or as a gemstone. Meanwhile, Midrash Rabba identifies יָשְׁפֵה, stating בנימין מרגליטוס - that Binyamin's stone was margalithos. Jastrow (pg 836) corrects the vav to a yud, and identifies it with Greek margarites chersaios, the name of a precious stone corresponding to יָשְׁפֵה. I do not know to what this corresponds. margarites in general appears to correspond to pearl, but Jastrow avoids this identification. Anyway, here is a wikipedia article on pearls. Jewish Encyclopedia did a much more comprehensive discussion of all these stones. See here. thus translating it onyx. What this means? Here is an image of black-banded onyx. Midrash Rabba states: יוסף פראלוקין - that Yosef's stone was paralvakin. What is this? According to Jastrow (pg 1213): it means "whitish" and corresponds to Greek paraleukos (?? Josh: perhaps corresponding to LXX's "the leek-green stone" ??) or perhaps a corruption of beirullion, that is, beryl, as discussed in the previous entry. I will not show a stone here, but will link to Wikipedia's entry on beryl. The first stone on the fourth row, that of Asher, is taršîš - תַּרְשִׁישׁ. What is this? The mineral beryl is a beryllium aluminium cyclosilicate with the chemical formula Be3Al2(SiO3)6... It has a vitreous lustre and can be transparent or translucent. Its cleavage is poor basal and its habit is dihexagonal bipyramidal. Pure beryl is colorless, but it is frequently tinted by impurities; possible colors are green, blue, yellow, red, and white. The name comes from the Greek beryllos for the precious blue-green color of sea water. Until I find contrary information, I will assume they do not mean emerald (smaragd) here but rather either the colorless or the the aquamarine variety, since this would be simply beryl, or would be equal to the ancient Greek beryl. 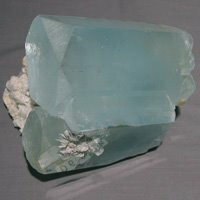 Here is a picture of aquamarine beryl. This makes some sense because Tarshish was a Biblical site that sent out ships. Midrash Rabba discusses תַּרְשִׁישׁ, saying: אשר קרומטיסין, that Asher's stone was kromatisin. What is this? Jastrow (pg 1414) defines this as cover (or color) of gold foils, name of a jewel in the High Priest's breastplate. The Greek is chrusolithos. According to Septuagint chrusolithos was one of the stones of the breastplate (lst stone, 4th row), but there is uncertainty as to the Hebrew text of the Septuagint in respect of this word; the name is not mentioned by Theophrastus. The chrysolithus of Pliny was a "transparent stone with a refulgence like that of gold." Those were most valued which "when placed by the side of gold, impart to it a sort of whitish hue, and so give it the appearance of silver." Note that this is not the same as modern chrysolite, but that didn't stop someone from puting in the Wikipedia article on chrysolite/olivine that Rabbenu Baycha identifies tarshish as chrysolite as the stone of Asher. We include no picture here since the specific identification is uncertain. 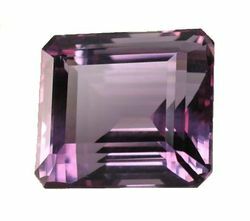 In antiquity, amethyst was quite costly, but nowadays has lost much value when large deposits were found in places such as Brazil. גד פימיסיון - that the stone of Gad was pimisyon. Alas, I cannot find any entry for pimisyon in Jastrow - perhaps a reader will have better luck. 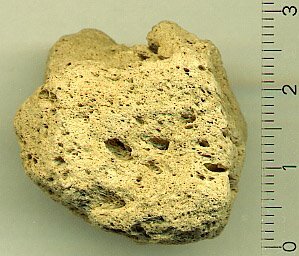 "Pumice is a light, porous type of pyroclastic igneous rock. It is formed during explosive volcanic eruptions when liquid lava is ejected into the air as a froth containing masses of gas bubbles. As the lava solidifies, the bubbles are frozen into the rock. Any type of igneous rock — andesite, basalt, dacite or rhyolite — can form pumice given suitable eruptive conditions." But perhaps it is something entirely different. Suggestions welcome. While I think that the "commentaries" on the bottom are a bit silly, given the explicit reason for the pictures, the top part of the page is interesting. 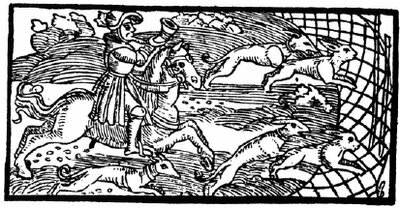 Apparently, because Yaknehaz (yayin kiddush ner havdalah zeman) sounds similar in German to "jag den Has," meaning "hunt the hare," some medieval haggadot included a picture of a rabbit hunt. If you read only one thing on the parsha this week, it should be Ibn Ezra on the egel, the golden calf. (And you should read it inside, rather than relying on my partial discussion, which also strays to add other interesting points.) He does his usual masterful job, taking on the classic midrashic approaches in order to put forth what he considers peshat. In this instance, he presents a defense of Aharon based on the text - not for the purpose of apologetics, or hagiography, but because it makes for good peshat. כד יֵאָסֵף אַהֲרֹן, אֶל-עַמָּיו, כִּי לֹא יָבֹא אֶל-הָאָרֶץ, אֲשֶׁר נָתַתִּי לִבְנֵי יִשְׂרָאֵל--עַל אֲשֶׁר-מְרִיתֶם אֶת-פִּי, לְמֵי מְרִיבָה. 24 'Aaron shall be gathered unto his people; for he shall not enter into the land which I have given unto the children of Israel, because ye rebelled against My word at the waters of Meribah. And if he really did a great sin by constructing the golden calf, we would have expected that to be mentioned. Furthermore, Hashem honors him after this. He and his children are perpetual priests in the service of Hashem, which seems strange if he did such a great sin. Furthermore, other prophecies are directed to him. Also, if Moshe commands the sons of Levi to kill those guilty in the sin of the golden calf, even if they be brothers, he should have to kill his own brother, or else look quite hypocritical. Furthermore, Aharon defends himself to Moshe shortly thereafter. We need to make sense of the words his defense. These and other factors suggest that as a matter of peshat, what Aharon did was not so bad. This is strange, since if worship of the calf is bad, certainly constructing it, and building an altar for it (if that is what he did) should be. Thus, a defense of Aharon need not be looked at as apologetics, but rather simply a means of obtaining peshat, and Ibn Ezra is a pashtan par excellence. Ibn Ezra first sets out on the task of rejecting several midrashic explanations of the event. Some of these are interesting in there own right. For example, Ibn Ezra rejects as nonsense an explanation that this was a different fellow named Aharon who constructed the golden calf! Ibn Ezra also rejects the suggestion that he did this because he "saw" (see וַיַּרְא אַהֲרֹן in Shemot 32:5) them kill Chur. After all, this would make him less of a man than Chur, or than Daniel's friends who were willing to be thrown into a fiery furnace rather than worship an idol. He also rejects suggestions that he was thus saving the nation from the sin of killing him, for which there would be no going back. He should have stood up to the nation as Moshe did when he returned. He rejects the interpretation that he was just throwing the gold into the cauldron and did not know that evildoers had tricked him, putting the mold for a calf in there, for that would make Aharon foolish. He rejects the interpretation that when Aharon says חַג לַה' מָחָר, he means that there will punishment for this, in the slaughter of all the sinners. Read it all in detail, for it offers good details of some interesting defenses, and one can then then see how they arise from the text. Obviously, Ibn Ezra rejects them, and the process of their rejection as peshat is also quite interesting. Ibn Ezra explains that there was a difference between what the people asked of Aharon and what Aharon did, on the one hand, and what some of the people (about 3000 of them) did subsequently on the other hand. Moshe disappeared for 40 days and 40 nights, and had not told the people at all when he would return. The people asked Aharon for a replacement for Moshe, and this is what Aharon agreed to do. They said קוּם עֲשֵׂה-לָנוּ אֱלֹהִים אֲשֶׁר יֵלְכוּ לְפָנֵינוּ--כִּי-זֶה מֹשֶׁה הָאִישׁ אֲשֶׁר הֶעֱלָנוּ מֵאֶרֶץ מִצְרַיִם, לֹא יָדַעְנוּ מֶה-הָיָה לוֹ. The word אֱלֹהִים means not a god, but something that will lead the way for them, directed by God. (And indeed, אֱלֹהִים on occassion does mean things other than "god.") Aharon then deliberately constructed a Golden Calf. However, some people (those killed by the Levites) then turned around and declared this their god, saying אֵלֶּה אֱלֹהֶיךָ יִשְׂרָאֵל, אֲשֶׁר הֶעֱלוּךָ מֵאֶרֶץ מִצְרָיִם. Aharon, meanwhile, tried to rally people to the service of Hashem, building an altar to Hashem, and declared a festival to as the pasuk says explicitly - וַיַּרְא אַהֲרֹן, וַיִּבֶן מִזְבֵּחַ לְפָנָיו; וַיִּקְרָא אַהֲרֹן וַיֹּאמַר, חַג לַה' מָחָר. Thus, idolatry was not intended by Aharon, or even by the majority of the Israelites -- only by a minority of the Israelites, who were killed. Thus, JPS translates šəḇo as "agate." Jastrow (pg 2) writes that this is a scribal error and the word should be read אכאטיס, with a kaf in place of the bet. One page 62, he states it is the Greek term for "agate." Agate is a term applied not to a distinct mineral species, but to an aggregate of various forms of silica, chiefly chalcedony. (Heb. shebo), a precious stone in the breast-plate of the high priest (Ex. 28:19; 39:12), the second in the third row. This may be the agate properly so called, a semi-transparent crystallized quartz, probably brought from Sheba, whence its name. In Isa. 54:12 and Ezek. 27:16, this word is the rendering of the Hebrew cadcod, which means "ruddy," and denotes a variety of minutely crystalline silica more or less in bands of different tints. This word is from the Greek name of a stone found in the river Achates in Sicily. but look around for other pictures. The next stone, which is the first stone on the third row, is the stone of Dan. The Torah calls it לֶשֶׁם - lešem. What is this lešem? JPS translates it jacinth. What is jacinth? Jacinth is a red transparent variety of zircon used as a gemstone. Jacinth is also a flower of a reddish blue or deep purple (hyacinth), and hence a precious stone of that colour (Revelation 21:20). 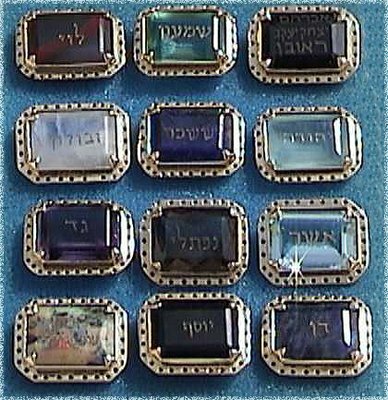 It has been supposed to designate the same stone as the ligure (Hebrew leshem) mentioned in Exodus 28:19 as the first stone of the third row in the high priest's breast-plate, the Hoshen. In Revelation 9:17 the word is simply descriptive of colour. I am uncertain in what sense JPS intends it - whether they mean the modern sense of red zircon. Jacinth is the same as hyacinth, which in ancient times might have meant blue sapphire, and in the Middle Ages meant yellow gems (including yellow zircon) from East India. I have already discussed this by bareqet, since Midrash Rabba identifies bareqet as hyacinth. Read up on it there. I won't put a picture of it here, since there are many possibilities of what JPS meant. Midrash Rabba states: דן כוחלין. The word carbuncle occurs in three places in most translations of the Bible. Each use originates from the same Hebrew word בָּרְקַת בָּרְקַת or bâreqath bâreqath (baw-reh'-keth, baw-rek-ath'). In this sense, a carbuncle is usually taken to mean a gem, particularly a deep-red garnet, unfaceted and convex; however, the Hebrew definition is less definite and the precise color of the gems is not known. The garnet group of minerals show crystals with a habit of rhombic dodecahedrons and trapezohedrons. They are nesosilicates with the same general formula, A3B2(SiO4)3. The chemical elements in garnet include calcium, magnesium, aluminium, iron2+, iron3+, chromium, manganese, and titanium. Carbuncle is a beautiful gem of a deep red colour (with a mixture of scarlet) . It was called by the Greeks anthrax and is found in the East Indies. When held up to the sun, it loses its deep tinge, and becomes of the colour of burning coal. The name belongs for the most part to ruby sapphire, though it has been also given to red spinel and garnet. Interestingly, so far, all stones in the first column seem to be red, based on Midrash Rabba's account, assuming I have reconstructed it accurately. The third stone on the second row of the choshen is יָהֲלֹם - yāhalom. JPS translates this as "emerald." And Midrash Rabba agrees that it is emerald. It states: זבולון אזמרגדין. Jastrow (pg 38) states it is equal to Greek smaragdos, which is emerald, though it can also mean a "colored crystal." This is confusing to me, because JPS already used "smaragd" to translate bareqet, so if smaragd = emerald, how can they use "emerald" here. Middle English emeraude, from Old French esmeraude, from Vulgar Latin *esmaralda, *esmaraldus, variant of Latin smaragdus, from Greek σμάραγδος, μάραγδος (smaragdos, maragdos), from Sanskrit मरकत (marakata). It is a green transparent form of beryl. And here is a picture of emeralds. The next stone on the chosen is the סַפִּיר - sappîr. The identification of this stone should be obvious, but it is not, because of a likely shift in the meaning of "sapphire." Now, sanpirinon is Greek sapphire. Jastrow's entry on the word (pg 1008) refers refers us to סמפירונין (pg 1003), which is sapphire, which in general = lapis lazuli. Now, the article in Wikipedia mentioned two points. 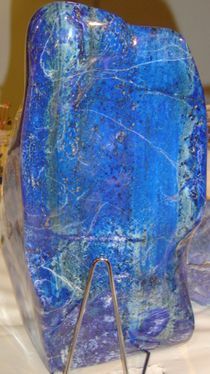 Firstly, Pliny uses the term "sapphire" to refer to lapis lazuli, since he talks of gold specks in it, which matches the flecks of golden pyrite in lapis lazuli. Secondly, another pasuk in Tanach, where the Hebrew is also סַפִּיר - sappîr strongly suggests that it also had specks of "gold" therein, and is thus lapis lazuli. which then matches Pliny's description. 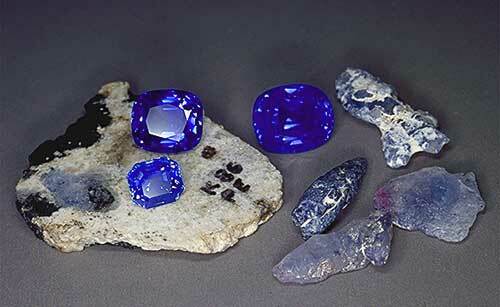 On the previous row, for bareqeṯ, I suggested sapphire, as in our modern sapphire. This is because "hyacinth," which was Midrash Rabba's translation of bareqeṯ, was most likely equal to our modern sapphire. But "hyacinth" also shifted in meaning, and in the Middle Ages meant yellow zircon, or yellow gems from East India. Here is a picture of modern sapphire, but remember, the sapphire here seems to be the lapis lazuli pictured above. So far, we have discussed ʾoḏem, piṭeḏah, and bareqeṯ as defined by the JPS translation and as defined by Midrash (Shemot) Rabbah. Now we turn to the next stone - nop̄eḵ. This is the first stone on the second row, and according to the Midrash was the stone of Yehuda (assuming we progress across one row at a time, in the order of the tribes). What is nop̄eḵ? According to the JPS translation, it is carbuncle. This is in accord with the Vulgate translation, which renders it carbunculus. What is carbuncle? Here is wikipedia's main article on Carbuncle. Someone has inserted something about carbuncle in the Bible, and claimed that it is always a translation of bareqeṯ, and is the third gem in the first row. This is the danger of relying upon one translation and then speaking authoritatively. I could edit the article and claim that alternatively, carbuncle is the translation of nop̄eḵ. What is baredinin? According to Jastrow (pg 190), the text should instead read כדכדון, kadkedon. What is kadkedon ? Jastrow (pg 614) states it is the Greek word χαλxηδών, that is, chalcedony. We have actually already mentioned in a a previous post, on the first stone, ʾoḏem. 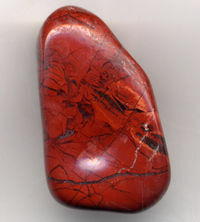 JPS had claimed that ʾoḏem was carnelian, which is red form of chalcedony, while Midrash Rabbah's sardonyx seemed to be onyx with red stripes instead of black stripes alternating with white stripes, and which is also a type of chalcedony. Chalcedony is one of the cryptocrystalline varieties of the mineral quartz, having a waxy luster. Chalcedony may be semitransparent or translucent and is usually white to gray, grayish-blue or some shade of brown, sometimes nearly black. Other shades have been given different names. A clear red chalcedony is known as carnelian or sard; a green variety colored by nickel oxide is called chrysoprase. 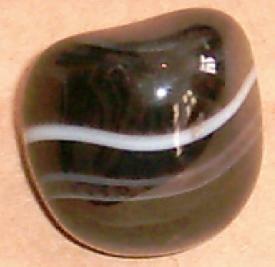 Prase is a dull green and onyx is black and white banded. Plasma is a bright to emerald-green chalcedony that is sometimes found with small spots of jasper resembling blood drops; it has been referred to as blood stone or heliotrope. Flint is also a variety of chalcedony. Similarly, while The New Testament Greek Lexicon defines chalcedony (which occurs in Revelations) as "a precious stone of misty grey colour, clouded with blue, yellow, or purple," it seems they are using the modern definition, which perhaps is not the same as the ancient or Middle-Ages one. I would need to see their basis for this identification. It certainly is not sardonyx, since we already have that. Perhaps it is onyx (with black stripes, matching the red striped chalcedony of the stone above)? Perhaps it is some other form of chalcedony. Thus, I am going to leave the picture out. You can find images of chalcedony over at Wikipedia. We need to know what chalcedony was in ancient times -- or, if this midrash was composed in the Middle Ages, what it meant in the Middle Ages. Mentioned only in Rev. 21:19, as one of the precious stones in the foundation of the New Jerusalem. The name of this stone is derived from Chalcedon, where it is said to have been first discovered. In modern mineralogy this is the name of an agate-like quartz of a bluish colour. Pliny so names the Indian ruby. The mineral intended in Revelation is probably the Hebrew _nophekh_, translated "emerald" (Ex. 28:18; 39:11; Ezek. 27:16; 28:13). It is rendered "anthrax" in the LXX., and "carbunculus" in the Vulgate. So according to Easton's 1897 Bible Dictionary, Revelations 2:19 uses the same Greek equivalent of nophech as does the Midrash Rabba. Perhaps. But I am not certain we can then use other translations of the same to identify chalcedony - e.g., to claim it is emerald, carbuncle, or anthrax. But perhaps (?) this is part of what led JPS to render this carbuncle. Latest in the absence of evidence files (part of an ongoing series) is the rat-rodent. Scientists only had fossils of this creature, and so assumed that it had become extinct about 11 million years ago. There was no evidence that it existed any more recently, and they did not see any in the wild today. 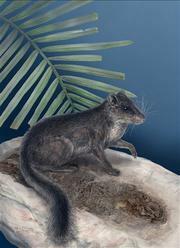 "It has the face of a rat and the tail of a skinny squirrel - and scientists say this creature discovered living in central Laos is pretty special: It's a species believed to have been extinct for 11 million years. "It shows you it's well worth looking around in this world, still, to see what's out there," Schaller said. The nocturnal rodent lives in Laotian forests largely unexplored by outsiders, because of the geographic remoteness and history of political turmoil. Schaller calls the area "an absolute wonderland," because biologists who have ventured in have found unique animals, like a type of wild ox called the saola, barking deer, and never-before-seen bats. Dawson describes it as a prehistoric zoo, teeming with information about past and present biodiversity. This is why it is difficult to claim that something absolutely does not exist just because you have not seen it -- in archeaological evidence, in fossil evidence, etc.. Quite often, new evidence arises to show that assumption incorrect -- and those are only the times that evidence happens to arise. Perhaps a summary post soon with links to the posts in the "Absence of Evidence" series. I found the following on the web. Naturally, the Temple Institute (in Israel) would try to reconstruct which stones were used for the choshen. I am not certain which gemstones they are using, but so far, my first row looks entirely different from their first row, except for the middle stone, which may indeed be peridot. The third stone is בָרֶקֶת. According to JPS, this is "smaragd," but this smaragd is what Midrash Rabba (according to Jastrow translation of the same) identifies as yahalom, the gemstone for Zevulun at the end of the next row. Perhaps one can connect the Hebrew term bareqet to beryl, Greek βήρυλλος. However, according to Midrash Rabba, this stone, for Levi, is דייקינתין. What is this? According to Jastrow (pg 305), deyaqintin is huachinthos - and he suggests the דיי is being used to avoid writing letters of the Divine Name. huachinthos is hyacinth. Yellow zircon is called hyacinth, from a word of East Indian origin; in the Middle Ages all yellow stones of East Indian origin were called hyacinth, but today this term is restricted to the yellow zircons. Thus it would seem to be a yellow gem. On the other hand, this website claims that hyacinth is blue zircon. I would suggest that a shiny yellow gem might fit well with the Hebrew description bareket. Perhaps it is possible to identify it more accurately, if we knew more about the Greek term. The ancient greeks applied the term to a flower and to a mythological figure. According to one myth, a blue hyacinth flower sprang from the blood of the slain Hyacinth. According to one website, the ancient Greeks used the term hyacinth to refer to red zircon. The hyacinthus of ancient writers must have been our sapphire, or blue corundum, while the hyacinth of modern mineralogists may have been the stone known as lyncurium (Xu1Koi~ifoe). Assuming this is so -- and I do not know any better, and this seems like an authorative source about the ancient Greek definition, as well as matching the blue color of the flower -- then we have an identification - sapphire, which is also known as blue corundum. The red variety of corundum is known as ruby. Naturally, the person adding Rebbenu Bachya references did so for the sapphire article, connecting it with סַפִּיר. Perhaps I should add Midrash Rabba's identification to this article. This completes the first row of the choshen. Stay tuned for the second row! The name derives from the Arabic word zarqun, meaning vermilion, or perhaps from the Persian zargun, meaning golden-colored. which makes be wonder, since the root is zrq, if there is some relation to the Hebrew bareqeṯ, brq. This is the second post in a series, attempting to identify the stones of the choshen, as defined by Midrash Rabba. The first post in the series is here. JPS identifies piṭḏah it as topaz, and in fact all the phonological elements of the word are there. The פ matches the p, the ט matches the t, and the ד without the dagesh matches the z, because such a daled is pronounced dh like the "the" in "either." Besides this, way, way back, there was a third letter, between ד and ז, that was pronounced dh, and which different languages recorded in different ways, because the Hebrew alphabet lacked a symbol for it. Generally, Hebrew uses a ז for this letter and Aramaic uses a ד for it. Thus, זו in Hebrew is דא in Aramaic. Later, when the ד had both plosive and fricative versions, in both Hebrew and Aramaic ד with no dagesh was pronounced dh. Perhaps we can claim some sort of metathesis for the swapping of the פ and ט. Or, perhaps the two words' etymologies are entirely unrelated. Read on, towards the end of this post, for more information on this. Midrash Rabba identifies Shimon's stone, piṭeḏah, as שימפוזין, shimpozin. Ignoring the in/os Greek ending, which every stone seems to have, perhaps we can say this is equal to topaz, since we have the pz ending, the sh is similar in sound to the ṭ, and the mem as a labial (as is בומפ) like peh perhaps developed as a transition between sounds. The mineral topaz is a silicate of aluminium and fluorine with the chemical formula Al2SiO4(F,OH)2. It crystallizes in the orthorhombic system and its crystals are mostly prismatic terminated by pyramidal and other faces, the basal pinacoid often being present. 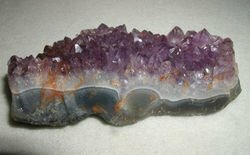 It has an easy and perfect basal cleavage and so gemstones or other fine specimens should be handled with care to avoid developing cleavage flaws. The fracture is conchoidal to uneven. Topaz has a hardness of 8, a specific gravity of 3.4-3.6, and a vitreous lustre. Pure topaz is transparent but is usually tinted by impurities; typical topaz is wine or straw-yellow. They may also be white, gray, green, blue, or reddish-yellow and transparent or translucent. When heated, yellow topaz often becomes reddish-pink. In general, someone has added a Rabbenu Bachya identification on many of these minerals. But no mention of a midrash rabba identification. Perhaps something for me to do when I go through all of these. The mineral olivine is a magnesium iron silicate with the formula (Mg,Fe)2SiO4 in which the ratio of magnesium and iron varies between the two endmembers of the series: forsterite (Mg-rich) and fayalite (Fe-rich). It gives its name to the group of minerals with a related structure (the olivine group) which includes monticellite and kirschsteinite. Olivine occurs in both mafic and ultramafic igneous rocks, and as a primary mineral in certain metamorphic rocks. It is one of the most common minerals on Earth, and has also been identified on the Moon. Alas, the article, while it has a picture, does not have one of yellow olivine. And it could be in theory any of these minerals with the related structure. So let us look up this transparent olivine, called peridot, in Wikipedia. Because we seem to have found an excellent match. Because peridot, if we eliminate the liquid r, is pidot, perhaps piṭeḏah - פִּטְדָה. Of course, the modern etymology only traces this back to Old French, but perhaps it goes back father than that. The chemical composition of peridot is (Mg, Fe)2SiO4. Peridot is one of the few gemstones that come in only one color. The depth of green depends on how much iron is contained in the crystal structure, and varies from yellow-green to olive to brownish green. Peridot is also often referred to as "poor man's emerald". Olivine is a very abundant mineral, but gem quality peridot is rather rare. 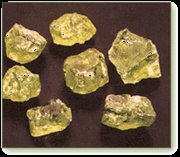 Peridot crystals have been collected from iron-nickel meteorites. From the same article, we see it was a gemstone used by the Egyptians. Peridot has been found in Egyptian jewellery from the early second millennium BCE and was mined from the volcanic island of Zebirget, or St. Johns Island, in the Red Sea. It makes sense that the olivine that was used as a gemstone would be the one in the chosen. Presumably Chazal, besides quite possibly having a tradition on the matter, knew that what contemporary Greeks were calling topaz was called in other languages something akin to peridot, similar to piteda. Alternatively, this was a tradition that this was piṭeḏah, and the French witness confirms the tradition. Here are pictures of peridot. So it is a transparent yellow green, with the green content defined by how much iron is in the crystal structure. 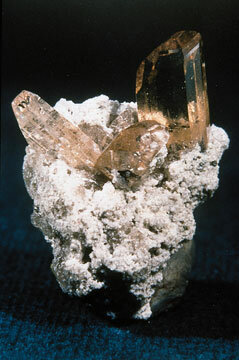 Overall, the JPS's translation of topaz (and Jastrow's same identification) is perhaps misleading, since in modern terminology it identifies aluminum or fluorine silicate, rather than the ancient topaz which seems (if Wikipedia is to be trusted) as being olivine, and particularly peridot, which is a magnesium iron silicate. Once again, I am an amateur, and I am sure there have been professionals researching this, but to me, at this point, it seems that peridot is the most likely candidate for piṭeḏah. parshat Terumah: tekhelet As Black As Kohl?